The first of the four churchy books that I've been assigned to read as part of a Presbytery-required Interim Pastor Training session is Creating a Healthier Church, by Ronald W. Richardson. 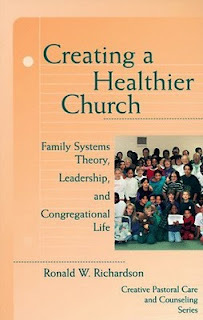 Written in 1996, it approaches congregational life through the lens of a pastoral counselor, and particularly through the application of family systems theory to church dynamics. The gist of family systems theory is that human beings are radically formed by their interpersonal connections, and in particular by the deep emotional bonds they have with their families. The responses of a particular individual can't be assessed by approaching them as a free-standing self. To really "get" them, you need to understand the network of relationships that form them. More or less. It's not a bad read, and there's some good practical learnin' in it. Of course, it tain't all daisies and butterflies, neither, so here are some of my reactions to it. Plus Side: It's quite practical. Understanding a church requires that you come to terms with the dynamics and relationships that form it. In both the anecdotal framing narratives Richardson uses and the processes of congregational assessment he presents, there's the potential of some real learning about the messes that can impact congregations, and some solid ways out of those messes. Plus Side: It pegs Congregational Anxiety as a major issue. In my experience in my own congregation, and from what I've witnessed elsewhere, communities of faith can be driven totally batty by anxiety about what might happen. In the absence of trust within the community, or the presence of real distrust of those viewed as "outside," a church can become just one big mess of rumors and infighting. Plus Side: It identifies the need for congregational leaders to be non-anxious presences. If you get all riled up whenever conflict or disagreement arises, and don't try to remain graciously positive and objective, you'll make an absolutely poopy pastor. That doesn't mean moping about apathetically and/or distancing yourself from your community. But it does mean that you aren't deep in the fray. You need to be able to constructively differentiate yourself from conflict if you're going to be a healing force within the church. True dat, thought I. Negative Side: It gets a bit chartish and jargony. Apparently, whenever two people talk about another person or concern, they are "triangulating." So there are triangles. And everyone has a network of influences, so there are these sample matrix thingys that map out their social networks and relative connection. Yeah, some people are visual thinkers, and they need this. But human interaction and the formative power of our relationships are just too complicated and dynamic to effectively map out this way. The maps would constantly change and flux...so I'm not quite sure, from a practical standpoint, why it's even worth bothering including them. The language used also and inevitably reflects the jargon of that particular strain of therapy. A healthy community, for instance, is supposed to avoid being "fused," which means we're supposed to be emotionally differentiated from each other. I get the point being made, but sometimes the language becomes a bit clumsy. Negative Side: God isn't really a factor. This tends to be one of the major sticking points I have with books that approach congregations primarily as human networks or organizations, and this book is no exception. The frame of reference is family systems, and the paradigm from which institutional dysfunction is addressed is fundamentally that of psychotherapy. I appreciate the tools of secular counseling, and can see their value in a wholistic approach to church life. But I found myself consistently and repeatedly reading this and wondering where in the Sam Hill the role of the Holy Spirit was in this approach. Mention of God is made intermittently, and once it is suggested, you know, that prayer might be helpful sometimes. Bible stories and verses are smattered about, with varying degrees of exegetical depth. But the focus remains primarily organizational dynamics and family systems. The tools of faith, and the idea that God is active and present in the life of the church, well...that's secondary, sometimes to the point of seeming invisible. Overall, this was worth my while. There were plenty of tools and teachings that really do speak to the sprawling messes that can overtake low-functioning congregations. My only and primary issue is the tendency to be so immersed in the professional language of the secular field from which it springs that it doesn't couch congregational health in terms of the Paraclete. That's a non-trivial variance in emphasis. Still, the insights here are good ones.